Those who participate in EFA/DPPE call for full and fair recognition of the stateless nations of Europe in the evolving constitution of the European Union. Not all contemporary European states are ‘nations’. Some are composite entities made up of several nations. These internal nations are sometimes called ‘stateless nations’ (or component nations and nationalities, federated states, autonomous communities, regions). EFA-DPPE assembles political parties involved in the quest for enhanced self-government for our stateless nations. EFA-DPPE proposes that, in accordance with the subsidiarity principle and the political and national diversity of the European Union and as outlined in the resolution of the European Parliament of 26 October 2000 on better lawmaking, the amendments made to the Treaties should specifically include recognition of, and respect for, the political and legislative powers of the Member States' internal political units (component nations and nationalities, federated states, autonomous communities, regions) in their executive, legislative and judicial relations with the EU institutions. We who participate in EFA/DPPE call for full and fair recognition of the stateless nations of Europe in the evolving constitution of the European Union. Democracy is the fundamental instrument for tackling the new challenges of our present-day societies. The European Free Alliance-Democratic Party of the Peoples of Europe (EFA-DPPE) wants to be in the vanguard of remedying democratic deficits, whether they are cultural, social, economic or ecological, whether European or worldwide. Not all contemporary European states are ‘nations’. Some are composite entities made up of several nations. These internal nations are sometimes called 'stateless nations' (or component nations and nationalities, federated states, autonomous communities, regions). EFA-DPPE assembles political parties involved in the quest for enhanced self-government for our stateless nations. It is committed exclusively to peaceful means in the pursuit of political objectives. 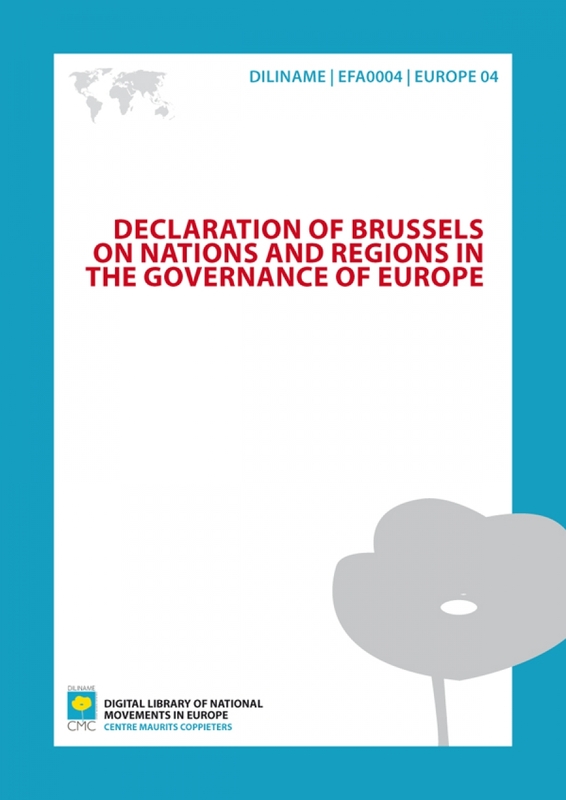 EFA-DPPE argues that stateless nations have the right of self-government and of participation in the world and in the European Union on equal terms with other nationalities, some of which are the possessors of complete states, others not. The recognition of such nations and of this inclusive and civic nationalism is fully compatible with and even assisted by the process of greater integration in Europe. It is necessary for the states and also for the European Union to explicitly acknowledge the existence of stateless nations. Sharing sovereignty is an appropriate form of acknowledgement. It is imperative that, on the occasion of the present IGC and of the future constitutional process of the EU, the question of allocation of responsibilities between different levels of government be effectively posed. Such an exercise would enhance transparency and would contribute to a more satisfactory implementation of the principle of subsidiarity. The case that EFA-DPPE makes on behalf of stateless nations clearly draws strong support from the principle of subsidiarity which it interprets extensively as the essential instrument to justify bringing decision-making closer to the level of the citizens. Bringing the administration closer to the entity administered is a sound principle in the organization of any governmental or managerial activity. The present idea of subsidiarity in the EC Treaty is commonly interpreted as regulating only relations between Union and states. If subsidiarity is really an operative principle of the Union’s constitution, then it must operate at all levels, with direct effect. This means that the democratic partnership among the various tiers of government (EU, Member States and their component parts that enjoy constitutional self-government) must be guaranteed in the EU constitution. It also means that there must be a right to effective participation in EU institutions by all the communities and countries of Europe. EFA-DPPE therefore proposes that, in accordance with the subsidiarity principle and the political and national diversity of the European Union and as outlined in the resolution of the European Parliament of 26 October 2000 on better lawmaking, the amendments made to the Treaties should specifically include recognition of, and respect for, the political and legislative powers of the Member States' internal political units (component nations and nationalities, federated states, autonomous communities, regions) in their executive, legislative and judicial relations with the EU institutions. The Commission must also address this issue while preparing its White Paper on the Governance of Europe. The direct presence of stateless nations in the institutions of the European Union is perfectly reasonable and lawful. It is necessary to review and make compulsory the mechanisms that may enable such presence in the Council and in Coreper and its preparatory committees and working groups by amending Article 203 of the EC Treaty. EFA/DPPE also emphasises that all states, regardless of size, should retain the right to nominate a Commissioner. EFA/DPPE regards the involvement of the national and regional parliaments in the European decision-making process by means of the scrutiny of EU legislation and of the actions of their Member State governments in the Council as vital, precisely with a view to the implementation of the subsidiarity principle. A key element in building a Europe of nations will be to ensure adequate self-representation of each nation, not only of states en bloc. In order to preserve the legitimacy of the European Parliament and the sense of belonging to the EU of the peoples it represents, the composition of the European Parliament must ensure that the peoples of the smallest states of the Union and also internal constitutional political entities are represented in a way suited to guaranteeing political pluralism. Should the number of Member States exceed 20, the maximum number of MEPs should be increased and the allocation of seats should be reconsidered on the basis either of an extrapolation of the current allocation scheme or of degressive proportionality. EFA/DPPE also strongly supports a reform of electoral laws to ensure that internal nations constitute separate electoral constituencies with their own elected MEPs. The European electoral map should be reformed to match the territorial framework of the nations, whether genuine nation states, or stateless nations. Furthermore fair and proportional access to the media in the context of electoral campaigns has to be guaranteed. In any case, the possibility of lists corresponding to a single European constituency has to lead to a corresponding increase of the number of MEPs. Further democratisation of the European decision-making process would call for a more radical reform, with legislative power vested in two chambers, the European Parliament and a reformed Council that would subsume some aspects of the present Committee of the Regions, consistently with sustaining the essentially confederal character of the European Union. There should be provision as soon as possible for federal and quasi-federal Member States to share out their votes in the Council among their federated entities. The regional dimension of European governance must develop in such a way as to be rooted in a genuine regional democracy, by contrast with the state-dominated character of the present Committee of the Regions. Notwithstanding the contemporary thrust towards globalization of markets, communication systems and the economy as a whole, in the European Union the institutional and cultural embedding of the economy differs from one Member State to the next and in most countries also from one region to the next. Indeed it is this diversity that is so specific to Europe. At the same time it is an important competitive asset. Not just for each region by itself, which can boost its economic success by means of an efficient institutional environment, but also for the EU as a whole, because the regions can learn from each other and best practices can serve as models. So the European Union has to preserve and promote the rich quality of the different cultures and languages existing within the Union. Broader recognition of the language-diversity of the stateless nations is necessary to give full respect to languages other than official state languages. That would in essence imply the acceptance by the EU of the different languages that have been officially acknowledged by the Member States and their internal nations or regions at the same level as the official EU languages. EU policies also have to respect the cultural diversity of the audiovisual systems of the stateless nations. Such acknowledgement of linguistic and cultural diversity has very deep roots in the endorsement and development of human rights. EFA/DPPE are committed to work towards the consolidation of human rights in their own stateless nations and states and by extension to the European Union and the whole world. EFA/DPPE therefore welcomes the Charter of Fundamental Rights of the EU and calls upon the IGC to decide that the EU can ratify the European Convention of Human Rights. EFA/DPPE considers the principle of democratic governance and respect of human rights as the main criteria for admission and membership of the EU. States must examine their own constitutions and government practices to eliminate any surviving elements of cultural repression inherited from an imperialistic past. EFA/DPPE also aims at rectifying the imbalance between the importance given to the "free enterprise" clauses of the EC Treaty and those dealing with social well being of Europe's citizens. It takes seriously the problem of poverty in countries beyound the EU and expresses strong solidarity with the developing countries, including particular responsibility for ACP countries. EFA/DPPE wants the post Nice EU constitutional process to embrace constitutional pluralism. Where there is a plurality of institutional normative orders, each with a functioning constitution, it is possible that each acknowledge the legitimacy of every other within its own sphere, while none asserts or acknowledges constitutional superiority over another. In this sense, the EU, the Member States and their component parts enjoying constitutional autonomy form interacting systems with non-hierarchical ranking between them and a European constitution ought not to be considered as the source of authority or legitimacy of the Member States, whose constitutions must remain fundamental from the viewpoint of each national legal order.